As one of the first manufacturers to release a convertible tablet into the market, Fujitsu's Lifebook T4410 is its latest effort. Strong usability and features are sadly hampered by a lack of software support, however. Like the HP TouchSmart tm2-1010ea, this laptop features a screen which twists 180 degrees to convert into a tablet PC. In this form you can hold the machine in one hand while manipulating the touchscreen with your other. The 2.2kg chassis is fairly light, although it is still a burden when held one-handed, and the overall look and feel is a little plasticky, especially when compared to the HP. 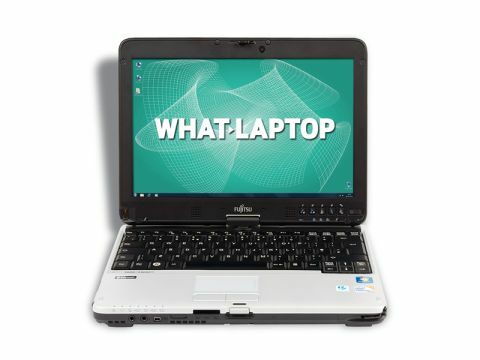 The sharp 12.1-inch screen is quite small in comparison to other touchscreen laptops, but to counter this Fujitsu has included a stylus which tucks neatly into the chassis for storage. This can be used instead of your fingers for more accurate interaction, while a pair of configurable buttons on the side can be set up to simulate mouse button clicks. The display is extremely sensitive and registers the stylus tip hovering over an inch from the screen, although this does show where you're about to press and helps to minimise mistakes. Ports are comprehensive, with ExpressCard, memory card, FireWire and HDMI ports all in place and a fingerprint scanner included for added security. However, storage is limited with just 160GB available. Bundled software is also lacking and falls far behind the Acer and the HP's efforts. Disappointingly, the only included touchscreen application is the Microsoft Touch Pack, which is also found nearly all other touchscreen laptops. While the Blackboard application is handy for scribbling notes and reminders with the stylus, the games are very basic. Besides the touchscreen, a standard keyboard and touchpad can be used when the laptop display is upright. The keyboard is excellent for touch-typing, with large and well-defined keys that are firmly set in the chassis. The touchpad is responsive when working at speed but is quite small. The Intel Core 2 Duo processor provides great performance, with enough power for multi-tasking with resource-hungry applications. Unfortunately, the integrated GPU greatly limits multimedia usage and is easily beaten by the HP's dedicated graphics card. Although highly usable and packed with features, the Lifebook T4410's touchscreen is sadly under used thanks to a lack of dedicated software. Performance is impressive compared to the HP TouchSmart tm2-1010ea although graphics power falls short and storage and build are also weak.